On June 7, 2018, President Xi Jinping held talks with President Nursultan Nazarbayev of Kazakhstan at the Great Hall of the People. The two heads of state both decided to consolidate the traditional friendship between China and Kazakhstan and march forward hand in hand on the journey of national rejuvenation. Xi Jinping pointed out that Kazakhstan is an important neighboring country of China and also an influential major country in the region. The China-Kazakhstan relations have become a model of friendly relations for neighboring countries. China is ready to take the lead with Kazakhstan on the road to build a community with a shared future for mankind and pool the wisdom and strength to create a brighter future for mankind. I am willing to work with you to lead the cause of China-Kazakhstan friendship. Xi Jinping stressed that both the Chinese Dream and the Kazakh Dream show the people-centered development philosophy and our pursuit of a bright future. China and Kazakhstan should join hands to move ahead, help each other and add radiance and beauty to each other. China will, as always, firmly support the domestic and foreign policies of Kazakhstan, and is willing to deepen cooperation with Kazakhstan in such aspects as fighting against the “three forces”, and intensify communication and coordination in international and regional affairs. Xi Jinping pointed out that when I first visited Kazakhstan five years ago, it was accompanied by Mr. President that I first put forward the initiative of the Silk Road Economic Belt at Nazarbayev University. In the past five years, the “Belt and Road” initiative has received active response from the international community. The key of the “Belt and Road” initiative being able to achieve positive results lies in complying with the trend of world peace and development and meeting the real needs of the development and cooperation of countries along the route. The “Belt and Road” initiative has become an important practice in promoting the building of a community with a shared future for mankind. In the past five years, the cooperation between China and Kazakhstan centering on co-building the “Belt and Road” has entered a new stage of deep integration and mutual promotion. The two sides should strengthen policy coordination, well implement the Cooperation Outline on Docking the Silk Road Economic Belt Construction and the New Economic Policy of the “Bright Road”, promote cooperation in production capacity, investment, economy and trade, energy, finance, connectivity construction, agriculture and innovation, and open up a new situation of people-to-people and cultural cooperation. China is willing to strengthen coordination and cooperation with Kazakhstan to push the Shanghai Cooperation Organization (SCO) cooperation in all fields to constantly reach new stages and continuously improve the level of overall cooperation of the Conference on Interaction and Confidence-Building Measures in Asia (CICA) so as to make the SCO and the CICA better serve the regional security and meet the development requirements. Nursultan Nazarbayev stated that China is a friendly neighboring country and an important cooperative partner of Kazakhstan. Kazakhstan cherishes its traditional friendship with China very much and thanks China for its long-standing strong support. China’s development has brought opportunities to Kazakhstan. Kazakhstan supports the cause of socialism with Chinese characteristics in the new era, and believes that its success will be also in line with Kazakhstan’s own interests. Kazakhstan adheres to the one-China policy and firmly fights against the “three forces”. The country is willing to continue to support each other with China in international affairs and intensify communication and coordination within the frameworks of the SCO and the CICA. The initiative of the Silk Road Economic Belt, which was first proposed by President Xi Jinping in Kazakhstan five years ago, will benefit the countries in the region. Kazakhstan is willing to strengthen the integration of the new economic policy of the “Bright Road” and the “Belt and Road” construction and deepen Kazakhstan-China cooperation in all fields. After the talks, the two heads of state jointly signed the Joint Statement Between the People’s Republic of China and the Republic of Kazakhstan, and witnessed the signing of relevant bilateral cooperation documents. After the signing ceremony, the two heads of state also jointly met with the main cast members of Composer, the first film co-produced by China and Kazakhstan, and watched the trailers. When Xi Jinping visited Kazakhstan in 2013, he spoke at Nazarbayev University about the touching story of forging the friendship between Chinese musician Xian Xinghai and Kazakh musician Bakhitzhan Baykadamov during the World War II. Inspired by this, filmmakers of China and Kazakhstan collaborated on filming Composer. 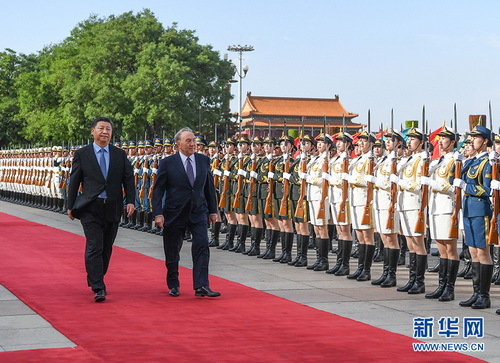 Before the talks, Xi Jinping held a welcoming ceremony for Nursultan Nazarbayev at the square outside the East Gate of the Great Hall of the People. Ding Xuexiang, Yang Jiechi, Eligen Imibakhi, Wang Yi, Xia Baolong, He Lifeng and others attended the ceremony.